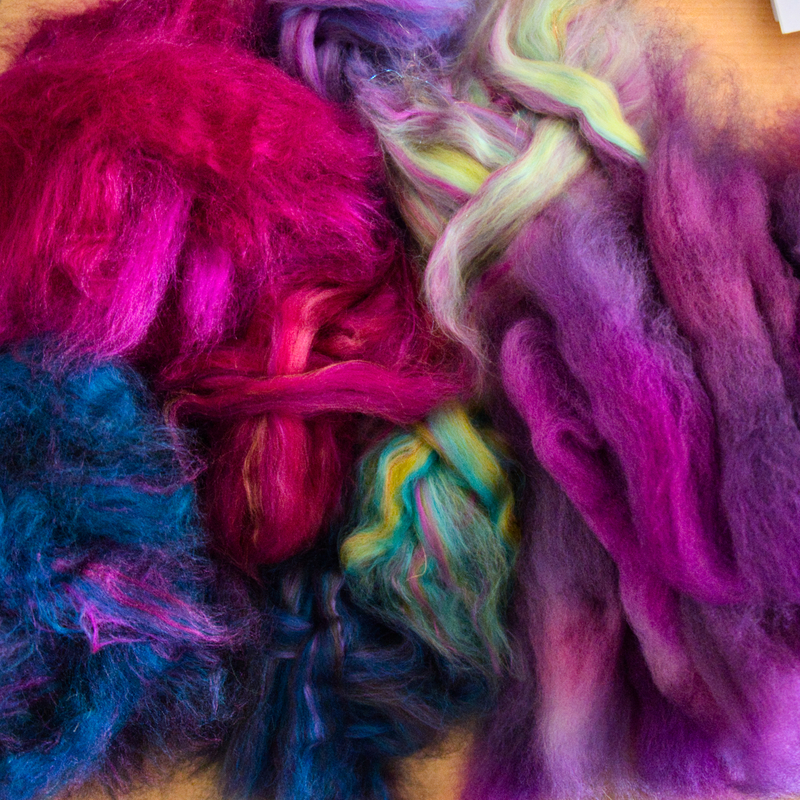 Last week I started a new spinning project in the MirkwoodArts Thriathlon. After finishing my hobbit-green project, I felt like spinning some more thick yarn. Winter is coming, after all! Well, Dutch winters are not that cold, but I can pretend to live in a country with real winters, right? 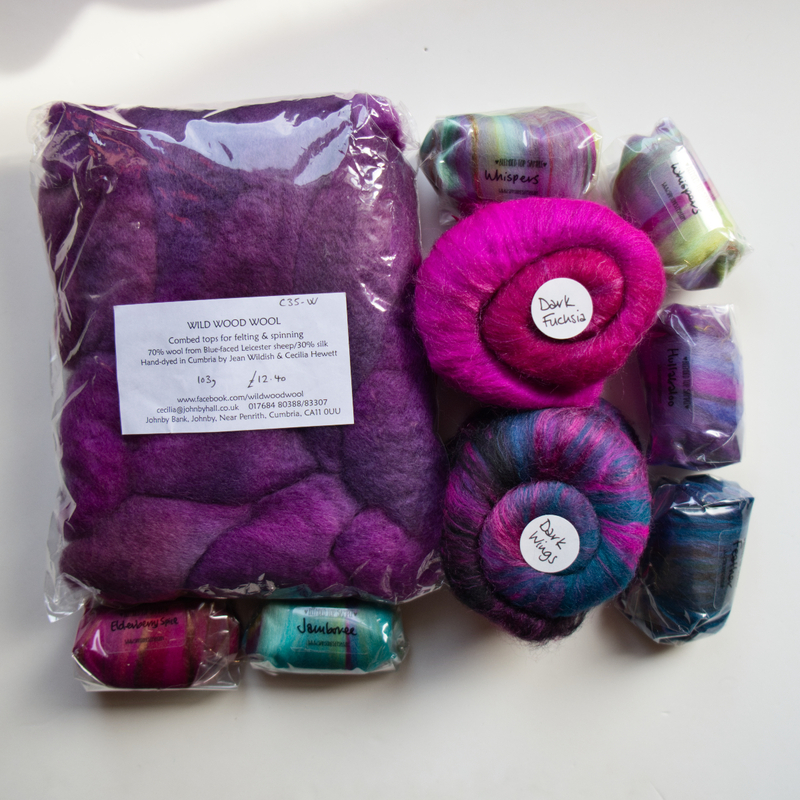 I went to my stash and selected a bag of beautiful BFL/silk fibre that I bought on holiday in England two years ago. It’s from Wild Wood Wool, and I bought it at The Wool Clip in Caldbeck. This year, we’re going on holiday in the same area, so I will revisit The Wool Clip for sure! 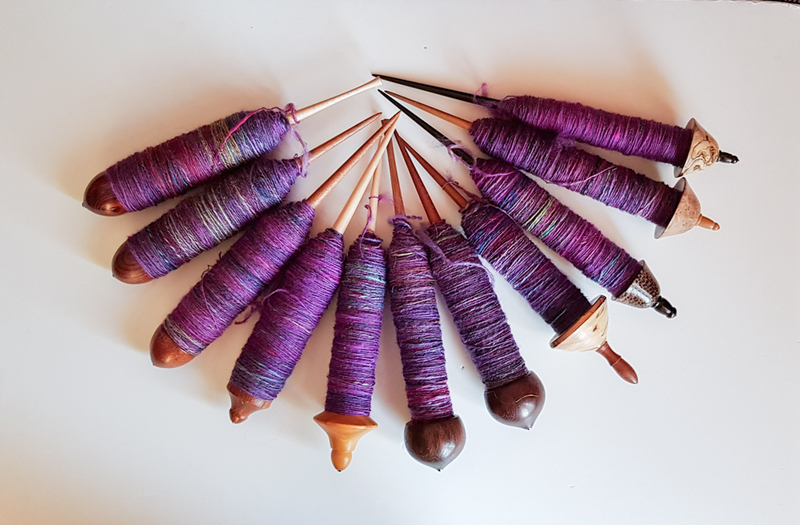 They have so many awesome fibre things, for example, gorgeous handwoven shawls from Jan Beadle, and impeccable tweed bags from The Hole House… I can’t wait! I also found two mini batts from Nunoco that fit really well with the Wild Wood Wool colours. These mini batts have been custom made for me a couple of years ago. They’re gorgeous! 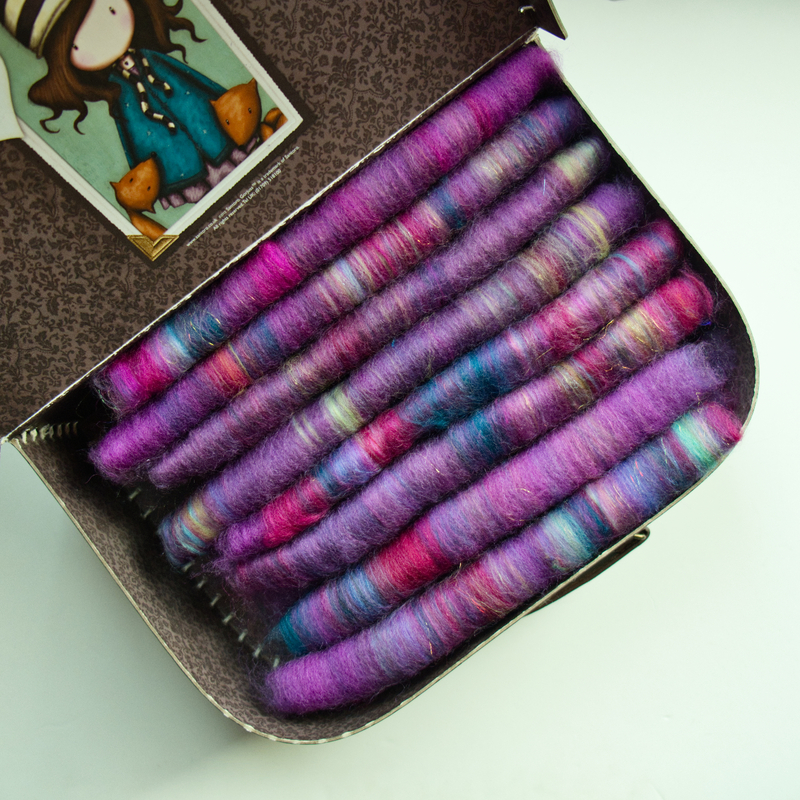 The small bits of fibre come from the Nunoco Spinoco box that was a temporary option around last year’s Tour de Fleece. They are perfect for sprinkling into your custom fibre blend, of to spin little bits for blanket squares, for example. I purposely chose colours that were different from the main colours. I like to use bits and pieces of other colours to make the result more lively. As green is the opposite of red, I chose some teal and lime, and I also added some warmer reds to the mix. I divided every fibre into 32 parts and started blending them together into rolags. The colours work quite well together, and the resulting colour is still mainly purple/pink. I really liked the thickness of my last spin, so I decided to continue to spin thick for this project as well. I had 220 grams of fibre, so I expected it to keep me busy for two weeks. I started spinning last Sunday. But apparently I spin twice as fast when I spin thick, and I finished the singles last night already! So I chain plied them this morning on my wheel, and I ended up with 221g/424m. Worsted weight! It’s very squishy and I love it! The Hobbits stage of the Thriathlon only ends by the end of the month. 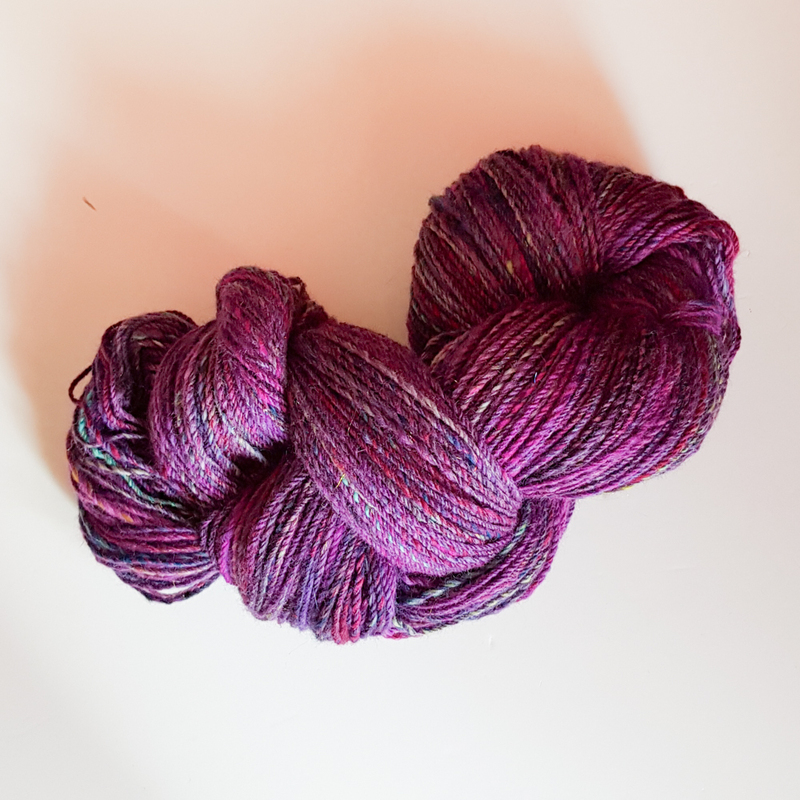 Can I squeeze in another spinning project? During the third stage, Dwarves, I will be mostly on holiday (yay!! ), so I won’t be spinning much. I’ll bring my knitting because it’s more convenient. Maybe another quick-n-thick?